Today is Saturday. The weather here is cloudy and cool; it rained during the night. More rain is predicted for Sunday. Normally, this would be ho-hum news, but tomorrow is the 26th annual Los Angeles Marathon. And cool, rainy weather makes it tricky for the runners. Before the race begins in Dodger Stadium, there's lots of standing around while thousands of people to check in, get their timing chip, stow their gear, etc. When it's cold, and possibly rainy, how do you stay comfortable? 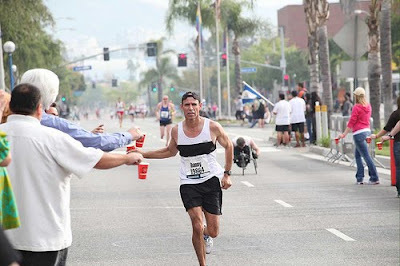 The website for the marathon has some answers. 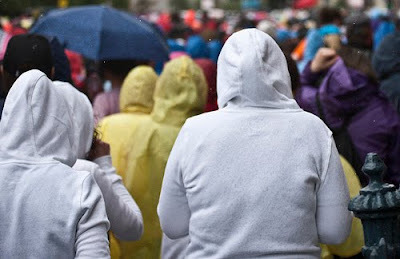 If it's rainy, the website suggests bringing a large plastic trashbag, with holes cut out for arms and head, to serve as a makeshift raincoat. If it's cold--and it is bound to be, even if it doesn't rain--the website suggests wearing a hat, gloves, warmup pants, and a sweatshirt. 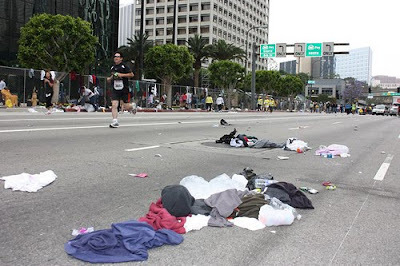 And here's the kicker: Runners can strip off their clothes as they begin the race, or as they run along, and volunteers will pick up all the clothing. Clothes discarded at Dodger Stadium will be immediately collected by the Salvation Army. Any duds tossed off along the route will be picked up by Marathon volunteers, then donated to the Salvation Army, as well. A friend of mine has a 20something son running in the race tomorrow. He says Dodger Stadium will be covered with piles of cast-off mittens, jackets, sweats, etc. by the time the runners cross the "Start" line. That must be quite a sight! 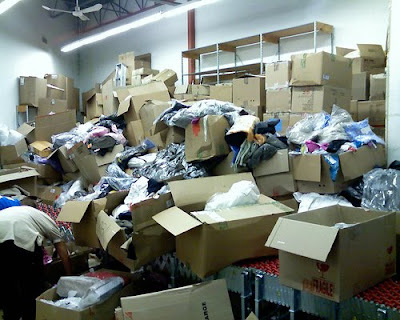 Thank goodness for the swift workers from the Salvation Army. Let's hope they sort it a little better than this.